There are many different birds on the Hawaiian Islands, but I am told told that there are no pelicans. 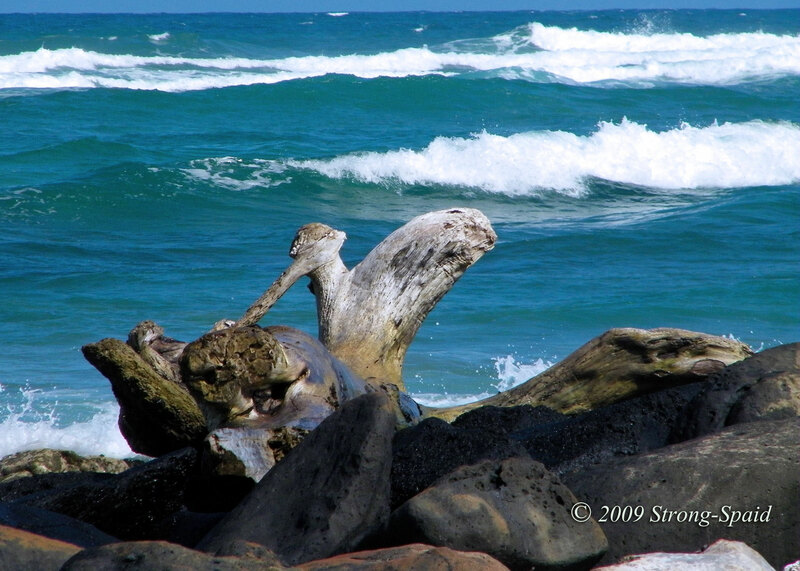 However, on a beach in Kapa’a, Kauai (near Lydgate Park)—I saw a large piece of driftwood that looked a lot like a pelican to me. A true work of art sitting in the wet sand, the driftwood was either carved by a human or slowly formed into this shape over time by Mother Nature. I guess I will never know for sure. Regardless, the wooden bird was quite a beautiful sight. Well you certainly did find one didn’t you Mary? Very nice. Actually, I am standing on that same beach right now! So glad to be here. Kauai, beautiful garden isle! That’s it Mary. Rub it in to us non paradise folks. 😉 Lucky girl.